One of my favorite things about writing the Wooly Bugged blog is the people it’s brought me in touch with. I’ve met some genuinely good human beings that I hope to keep friendships with for a long time. Earlier in the spring of this year a fella by the name of Matt Willison reached out to me on Instagram and told me I needed to come down and see the Savage River in western Maryland. One of Matt’s close friends, Brad Burbas, eventually reached out to me as well and we all struck up a new friendship through social media. I specifically remember one weekend where I’d traveled to western Pennsylvania and fished the Casselman River down into Maryland. Brad saw me post some pictures and asked when I’d be down to meet my “brothers in trout.” As things often go, my paths went other directions in the spring and early summer and I never got down to fish the Savage River or its tributaries. Last week eastern Pennsylvania saw a lot of rain. There was so much rain that many of the streams within 25 miles of my home saw flooding that was on the verge of being historic. The rain fell from Saturday, July 21st through Wednesday night, July 25th. The Susquehanna River was still over 15 feet in Harrisburg on Friday morning and bass fishing anywhere locally was out of the question. Friday evening I knew that it was going to be tough to find any kind of fishable water for Saturday. I decided to reach out Matt and Brad in Maryland and see what the water looked like in the Savage River watershed. Matt responded to my Instagram message and said water levels were ok. He said the flows were on the low end, even after all the rain that had passed through the area earlier in the week. Matt works at the paper mill at the boundary of West Virginia and Maryland, where the Savage River dumps into the North Branch of the Potomac. He can take a short drive and have information on water conditions in a few minutes. After hearing a positive report, I decided I’d head to Maryland early the next morning. I was up at 3:00AM on Saturday morning so I had time to make the three and a half hour drive to western Maryland to meet Brad at the Savage River Outfitters parking lot at 7:00AM. I needed some caffeine to stay alert during the drive and was fully awake as the sun rose over the mountains at the Pennsylvania and Maryland border. I stopped at the rest stop and took in the view for a few minutes. I thought about how beautiful the Mid-Atlantic is and how blessed we are to have so many wild trout fisheries so close. After a quick picture I was back on the road and I texted Brad letting him know I’d be a few minutes late. The summer sunrise over the Pennsylvania and Maryland border. As my GPS neared its flagged destination, I could see a familiar face from Instagram waiting for me in the parking lot. I parked and hopped out of my truck and gave a big “what’s up” to Brad. He said he recognized my voice from my YouTube channel and we were instantly talking fly fishing. It’s amazing to me how a shared passion for the outdoors can instantly connect two people who’ve never met before. Brad explained that Matt had to work in the morning and would be meeting us at an Upper Savage River tributary named Poplar Lick Run at 2:00pm that afternoon. Matt had instructed Brad to show me around on another local tributary called Crabtree Creek (“Crabtree”). After briefly chatting, we hopped in our trucks and I followed Brad up Savage River Road past the Savage River Reservoir Dam and out to the southwestern corner of the reservoir where Crabtree Creek dumps in. There was an easy to find pull-off on the lower Crabtree and there were signs on several of the trees making it clear to visitors that the stream is managed under a zero creel limit (catch and release). In fact, all of the tributaries to the Upper Savage River and Savage River Reservoir are managed under a zero creel limit and fishing must be done with artificial lures only. What makes the Savage River brook trout tributaries unique is that the Upper Savage River and Savage River Reservoir connect them. This allows the brook trout to migrate during different times of the year and these trout are able to reach larger than average size. 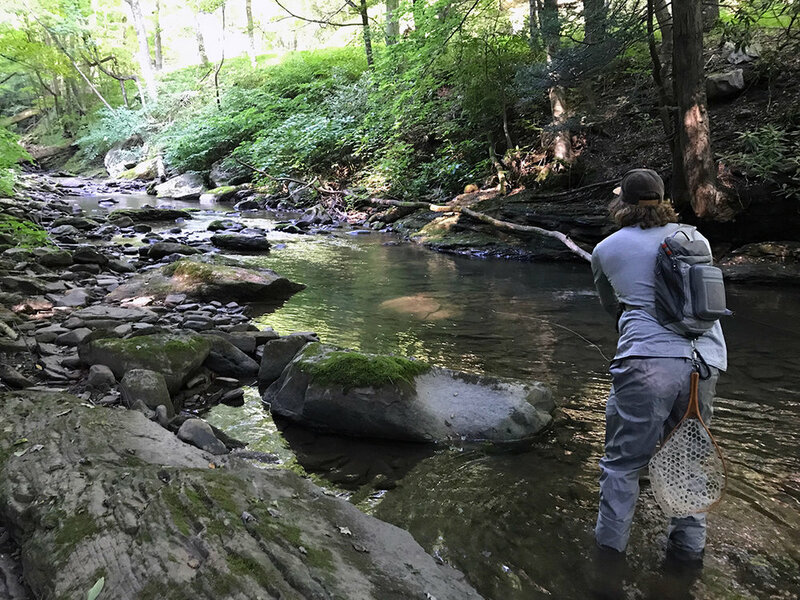 The Upper Savage River brook trout fishing is great year-round and is one of the only places in the Mid-Atlantic where a fishery like this exists. It is a special place and has been studied extensively by biologists. The pool Brad and I started our day fly fishing at. Brad and I got our fly rods set-up and I decided to use my G-Loomis Pro 4X, 8’-4wt. I decided to use a 9’-5X leader with 5X fluorocarbon tied off the end. I walked down to the creek and the water appeared low, but it was very fishable. I took the temperatures and they were in the low 60s. Just a few yards upstream was a long pool that looked like a sheet of glass with steam rising off it. I decided to tie on a #16 CDC Tan Caddis dry fly pattern. As I was ready to make my first cast, Brad joined me. I laid a perfect cast on the water and my dry fly floated down to the surface of the water right next to a rock that sat on the far side of the pool. I waited, no take. I cast again and then again, no take. I was shocked! Brad explained that although there were many brook trout, in low clear conditions they could be picky and that he’d had a lot of success with the custom Parachute Adams (“Adams”) that he had tied on. Brad reached into his fly box and gave me an Adams of my own to tie on. We both moved 25 yards upstream to the next promising pool. I back cast twice and laid the line on the water, allowing the Adams to move along the slack current. When the fly reached where the slack water joined with the turbulent riffle water, a brook trout broke the surface and took my fly. I was hooked up with my first Crabtree Creek brook trout. I always enjoy catching a fish for the first time on new water. I take an extra moment to look at it and capture a picture if possible. My first Crabtree Creek brook trout. Throughout the morning, Brad and I took turns casting at probable brook trout lies and after we’d catch a fish, we’d keep moving upstream. At some point during the morning I changed out my dry fly rig to a nymphing rig. I used a pattern my buddy Wildman Schoenfelt tied for me, a #18 nymph with a hare’s ear body, a pink bead, and a red tail. This pattern was deadly. I had so many hook-ups on this pattern it was incredible. And I did stop to try other patterns and had no success. Just before lunchtime, Brad and I reached a large hole with a waterfall pouring into one end. I must’ve cast my nymph rig to the head of the pool ten times before Brad suggested I try his Woolly Bugger rig. I told him I’d rather watch him fish it first. Brad had tied a #8 White Woolly Bugger on the end of his line and placed two large split shot about a foot above the pattern. He threw his line to the base of the waterfall and let it sink down to the bottom of the hole. Then he began retrieving and twitching his line and suddenly he hollered as he hooked up with a mature brook trout. It is true that the biggest fish in the hole always hit the streamers. After he landed and released this beautiful trout he passed his fly rod over to me and gave me a quick lesson on how he retrieved the fly. I cast out to the far end of the pool where the water created a small side channel underneath of a rocky overhang. As the Woolly Bugger sank and I was on my last short strip, a good-sized brookie grabbed the fly and ran with it. It was an awesome hook-up and the first time I ever caught a brook trout on a Woolly Bugger. After each of us caught a good-sized fish we decided to break for an early lunch. We headed to Duckie’s Bar & Grill in Westernport, Maryland. What a great place for lunch if you are in the area. They have a great menu of chicken wings. The beautiful brook trout I caught on a #8 White Woolly Bugger. During lunch Matt Willison met up with us. I’d never met Matt so we got a chance to get to know one another. He’s been fly fishing for less than a year and it was neat to hear how passionate he’d become in such a short time. After we finished eating we headed back into the Savage River State Forest. Matt wanted to show me another brook trout stream called Poplar Lick Run. This tributary is north of the reservoir and pours into the Upper Savage River. There was an easy to find parking lot, as this area is also home to a well known hiking trail. We all got our waders back on and rigged our rods. The air temps had risen to almost 90 degrees in the afternoon and it was miserable wearing waders. However, as Matt talked of having three ticks the last time he cam out of these woods, I got over the heat of wearing them. Matt fishes for a brookies with a 7’-6” – 3wt Eagle Claw fly rod. He said he only paid $30 for the rod and he had it outfitted with a Reddington Drift Reel. The reel was more expensive than the rod. I was impressed with how the rod looked for being cheap. Matt headed down the trail into the woods and we followed. When we arrived at the creek, we were all surprised to see that there was little to know water in it. We walked along the rocks heading upstream. Matt said there was a good pool he liked to start at. When we arrived, there was a pool, but it had a trickle of water moving into it. Matt threw a sulphur pattern onto the surface and nothing happened. He worked it to the far end and no luck. As I moved close to the pool, I watched at least two brook trout swiftly move out from under a rock and move to another rock. I could tell Matt was disappointed because he’d wanted to share this stream with me. We walked upstream to look at one more spot but we found the same results (ironically, I’d find out later that the fish in Poplar Lick like to migrate to different waters in the heat of the summer and this explained how the population would suddenly reappear in the mid-autumn, early winter). I suggested we move onto new water and Matt and Brad agreed. We decided to drive back to Crabtree Creek and fish further upstream from where Brad and I had fished that morning. Once we arrived, I told Matt that I wanted him to stay out in front of us and do all the fishing since he’d been working all day. Matt worked his sulphur pattern on every pool and run as we moved upstream. Although impossible to know, it seemed as if they fish had shut off and with the sunshine of the day it didn’t surprise me. We kept walking until we reached a private stretch and then decided to call it quits. Matt Willison fishing one of the first holes on Crabtree Creek. Brad wanted to take me down to the Savage River at the Savage River Outiftters Fly Shop. We drove down and we stopped into the shop with Brad. I purchased a cheap pair of nippers as I’d lost my Abel nippers that I’d carried with me since the beginning of this blog. It was disappointing, but what upset me more than anything was that to get any pair of nippers that would come close to being as good as my Abel nippers had been would cost me at least $50 or more. After we talked with the guy at the fly shop we headed down to the water behind the shop. There are some very deep runs and beautiful riffles in this stretch of the river. The water is very technical and the fish there are highly educated. Like the old timers like to say, these fish have PHD in fly inspecting. We threw nymph rigs and dry flies until the daylight started to fade to evening and soon we’d all given up hope of catching a lower Savage wild brown trout. Brad had to get home to a crying child and Matt had to get home to his wife, and then there was me. I just had a three and half-hour drive home. I said good-bye to my “brothers in trout” and we hoped we’d meet again one day.